Unknowingly cast as the bachelorette for her town's charity event, Taycee Emerson wants out. Especially when she discovers her old teenage crush, Luke Carney, is one of the bachelors and it's up to the viewers - not her - to decide which bachelors stay or go. Coerced into participating, Taycee does what any self-preserving girl would do. She launches a subtle attack on Luke's good name with the hope of getting him voted off the show. Unfortunately, Luke's an eye-for-an-eye kind of guy, and when he discovers what she's up to, it means revenge. This book is labeled a romantic comedy and it lives up to that name. It's a light-hearted, fun and clean story about a girl who's not quite over her teenage crush and childhood friend, Luke. When her friend coerces Taycee into being the town bachelorette to help raise money for the farmers, Taycee's otherwise quiet life as a florist goes viral. Taycee is a simple girl with a complicated love life. She is a well-built character in the story, and although I didn't always relate to her, I liked her. Some of the other characters are somewhat cookie-cutter, but it's a romantic comedy and suits the story. I listened to the audiobook version of this book and thought overall Jennifer Reilly does a good job of narrating. She grew on me as a narrator. 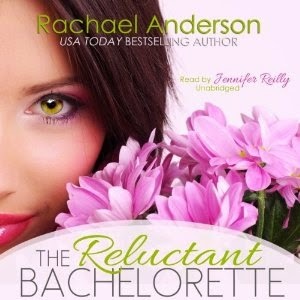 The story kept me entertained and made me wonder if I could have handled being a bachelorette when I was younger. Probably not, when I think of all the unwanted exposure and attention it gives a person. Which made me appreciate what Taycee did to help out her town. I'm not a fan of The Bachelorette TV show, but if you are, I think this would certainly appeal to you. The author creatively used this theme as a plot for a romantic comedy, and came up with a fun story to chase away the blues.Oh, and I like the book cover. It's perfect for this novel. Disclosure: Thanks to the author and Audiobook Jukebox for sending me this audio book for review. I was not compensated in any other way, nor told how to rate or review this product. LISTEN UP! is a monthly link-up of audiobook reviews. If you listen to and review audiobooks be sure to link up here so others can visit your blog and see what you're listening to!